So far the unit has performed flawless, I have no issues running my VM's or mounting ISO's from the drive and I don't really notice any performance issues. The drive itself is pretty compact (being a 2.5" drive) and the case only adds about an inch more to the over all length of the drive. The only issue I have is not with the drive but with the cable that came with it. Most generic 2.5" drive enclosures come with two separate cables, one for data and one for power. 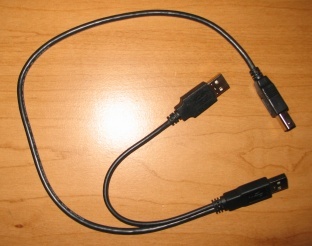 This drive comes with one cable but has two USB ends and one end that plugs into the drive (see Picture below). The issue is the two plugs need two USB ports closer than 6.5” inches or you are forced to purchase an extension cable. This is probably fine for most tower setups but a lot of laptops (older ones) don’t have two USB ports that close together. Fortunately my HP does but I can see how this might cause issues for users who may have an older laptop.